Wayne Helliwell, Jr., is aiming for a piece of stock car racing history at Devil’s Bowl Speedway. The two-time American-Canadian Tour champion will attempt to win a Devil’s Bowl “Grand Slam” by becoming the first driver to ever win four consecutive ACT Late Model Tour races at a single track when the series rolls in for the 101.5 The Fox Spring Green 114 on Sunday, May 4. 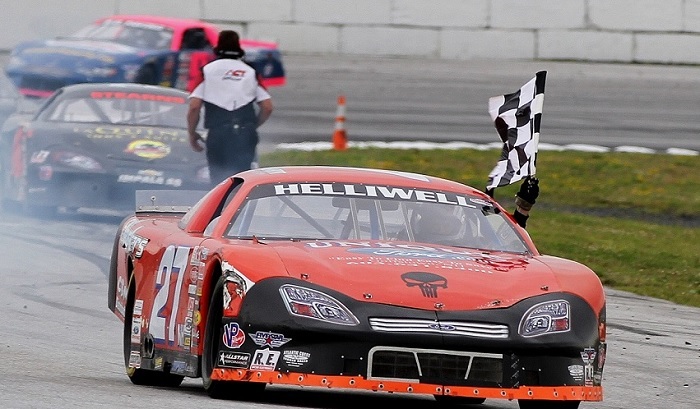 Helliwell, of Dover, NH, is undefeated in ACT’s last three appearances at the fast half-mile, winning the Spring Green in 2012 and 2013, as well as the St. Jude Children’s Hospital 150 last July. Should he pull off the four-peat, he’ll achieve something that ACT legends Brian Hoar and Jean-Paul Cyr could not; Hoar won three-straight at both Thunder Road in Barre, VT and Canada’s Circuit Riverside Speedway, and Cyr won three in a row at Airborne Park Speedway in Plattsburgh, NY, but each fell shy of a fourth consecutive win. In the Tour’s two stops at Devil’s Bowl last season, Helliwell beat Hoar to win the Spring Green in a photo finish for the closest margin of victory in ACT history – .027 seconds – and in July, Helliwell benefitted from Ray Parent’s car running out of fuel with only four laps remaining. Helliwell expects Hoar and Parent to be tough again on May 4, but also named Joey Polewarczyk, Jr., Jimmy Hebert, and Travis Stearns as potential winners. Polewarczyk has three consecutive finishes of fourth or better at Devil’s Bowl, and Stearns had three top-fives in four starts at the track last year as a rookie. Hebert finished third in the 2013 Spring Green and performs well on longer, flatter tracks similar to Devil’s Bowl. Spring Green weekend opens Saturday, May 3 with the Downtown Fan Festival in Rutland City, presented on-air by 101.5 The Fox. A free car show will on Center Street opens at 9:00 a.m., followed by a pit stop competition at 11:00 a.m. and a rolling sendoff through the streets of Rutland at 12:00 noon. The racing season begins on Sunday, May 4 at 1:30 p.m. with the 101.5 The Fox Spring Green. The event is also the opener for the NASCAR Whelen All-American Series, with action in the Bond Auto Parts Modified, Renegade, Central Vermont Motorcycles Mini Stock, and SK Light divisions. General admission is $20 for adults, $18 for seniors (62+), and free for kids 12 and under. Devil’s Bowl Speedway is located on Route 22A in West Haven, VT four miles north of Exit 2 on U.S. Route 4. For more information, call (802) 265-3112 or visit www.devilsbowlspeedwayvt.com. Devil’s Bowl Speedway is on Facebook at facebook.com/DevilsBowlSpeedway and on Twitter and Instagram at @DevilsBowlSpeed.